How Do SNTs Affect Beneficiaries with Special Needs’ Eligibility for Subsidized Housing? The federal and state governments subsidize some housing under programs such as “Section 8” for people with special needs. Some people who want to apply for Section 8 have special needs trusts (SNTs) that benefit them. If you are considering Section 8, you may wonder how having an SNT affects eligibility. Section 8 has strict income eligibility rules. To qualify for Section 8, it does not matter how many assets someone has. Any income earned from certain assets does count toward eligibility. Your total income affects whether you qualify for housing at all, and how much rent you pay if you qualify. For example, the interest earned on a bank account balance would count toward someone’s total income. In addition, if a trustee pays a beneficiary regularly from the trust, or if the trustee pays bills for the beneficiary regularly, the amounts paid could count toward total income. Further, if the beneficiary has any control over spending trust income or principal, all the income will could toward total income. For applicants who are beneficiaries of special needs trusts, the Section 8 program counts only regular trust distributions toward total income. This includes regular bill payments by the trustee, distributions every month or year, and similar transfers from the trust funds to the beneficiary. Irregular distributions, however, will not increase total income for Section 8 purposes. Practically speaking, people who benefit from SNTs and their families need to do some advance planning to get the most out of Section 8. If an SNT trustee makes regular distributions to the beneficiary, the beneficiary’s Section 8 rent will likely be higher than if he owned the assets outright. This is because only income such as regular trust distributions are counted for eligibility, not assets themselves. To avoid unnecessarily high rent payments, the trustee should plan distributions that are not regular monthly payments. For example, the trustee could make a few irregular, larger advance payments toward a bill rather than paying it monthly. There are further complications for Section 8 eligibility. Depending on the state in which you apply for Section 8, distributions from self-settled SNTs and distributions from third-party SNTs could be treated differently. 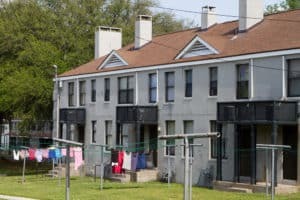 Public housing authorities who run the Section 8 programs and courts are still not consistent on how to treat income from different kinds of special needs trusts. If you or someone in your family benefits from an SNT and wants to apply for Section 8 housing, talk to the trustee about how to make distributions that will minimize total income for Section 8 eligibility purposes.